The Eighth Judicial District Commission on Judicial Performance unanimously (10-0) recommends that Judge Caroll Michelle Brinegar BE RETAINED. Judge Brinegar was appointed to the Larimer District Court in December of 2013. As a District Court Judge, she presides over criminal, civil, domestic relations, mental health, and juvenile delinquency cases. Prior to being appointed to the bench, she served in the Larimer County District Attorney’s Office. Judge Brinegar received her undergraduate degree from Colorado State University and her law degree from the University of Denver College of Law. 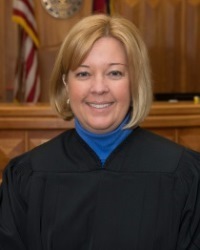 The Commission conducted a personal interview with Judge Brinegar, reviewed opinions she authored, observed her in court, reviewed comments received from interested parties during the evaluation, and reviewed survey responses from attorneys and non-attorneys who had experience with Judge Brinegar. The survey asked “How strongly do you recommend that Judge Brinegar to be retained in office?” Of the attorneys and non-attorneys completing the survey, 92% of the combined groups recommended retention. Of the attorneys responding, 84% recommended retention, 4% recommended non-retention, and 12% made no recommendation. Of the non-attorneys responding, 97% recommended retention, 3% recommended non-retention, and 0% made no recommendation. A total of 26 attorneys and 33 non-attorneys completed the judicial performance survey regarding Judge Brinegar. Judge Brinegar received high marks with respect to her demeanor. Judge Brinegar is often described as calm, fair, and respectful. She speaks clearly and provides patient clarification to defendants and other non-attorneys who appear in her courtroom. Because she came from a criminal law background, Judge Brinegar admittedly struggled with civil docket initially, but she worked to expand her knowledge in this area of the law using other judges and training opportunities as resources. In addition, as a former prosecutor, the Commission finds that Judge Brinegar needs to guard against the potential for perceived bias. Nonetheless, survey respondents were unanimous in finding that Judge Brinegar was “completely neutral.” Commission members were very impressed with Judge Brinegar. During her Commission interview, Judge Brinegar expressed openness to constructive feedback and demonstrated tremendous insight with respect to her strengths and weaknesses during her first couple of years on the bench.